GCF is an acronym for "Greatest Common Factor." GCF is the largest number that can divides evenly into 2 or more numbers. The first step to finding the GCF is to use what you know about prime factorization. Using a factor tree, find the prime factors of each number. 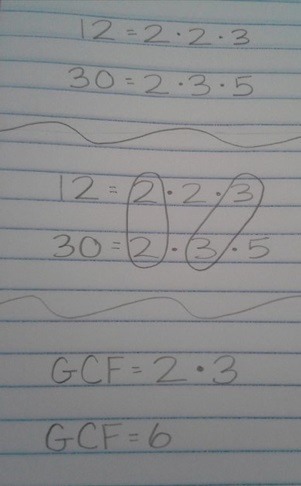 In this example, we will look for the GCF of 12 and 30. What is the GCF of 6 and 14? What is the GCF of 8, 12, and 18? What is the GCF of 3 and 9? The GCF of 6 and 14 is 2. The GCF of 8, 12, and 18 is 2. The GCF of 3 and 9 is 3.